"Introduction to Genealogy: Getting Started"
Genealogy is the science of researching the relationships of individuals and their families from generation to generation. To trace your ancestors, we start with ourselves. 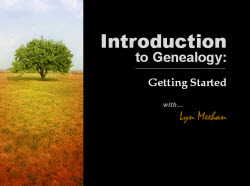 This presentation is an introduction to basic genealogy. You will become acquainted in developing a plan, building your road map and gathering documentation.